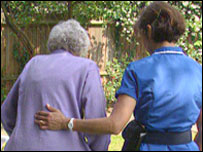 Abuse and neglect of elderly people in Britain has become widespread, according to a survey. A quarter of those questioned said they knew an elderly person who had been mistreated, the survey suggested. And out of these respondents, 1 in 10 cited examples of physical abuse. Cases of elderly people being left unfed and humiliated were also highlighted. The GfK NOP poll of 1000 people aged 16 and over was conducted in May and was commissioned by BBC Radio 2. More than half of all the respondents believed that there was a great deal of neglect and mistreatment of the elderly in Britain - a percentage that rose to 60% among females. According to those polled, the majority of neglect and mistreatment occurred in care homes - 53% - and hospitals - 48%. Broadcaster Jeremy Vine, who will launch BBC Radio 2's campaign against elder abuse, said: "This poll is really shocking. Our elders deserve love and care but many, too many, are being hurt or neglected behind closed doors - just where we don't see what's happening. "I hope Respect Your Elders will raise awareness and tell us more about what's going on. That way we can help elderly people who currently feel totally alone with their pain and fear." BBC Radio 2 listeners will be invited to share their own experiences of elder abuse during his show. The radio campaign comes ahead of World Elder Abuse Day on 15 June. Bridget Penhale, senior lecturer in gerontology at the University of Sheffield and a leading expert in the study of elder abuse, believes the survey has highlighted an issue that demands more attention. "We are at the point now where elder abuse is publicly recognised as a serious problem for older people," she said. "The major challenge ahead is to develop appropriate responses to abuse when it occurs." She outlined a need for "preventative measures and strategies" to enable older people to live their lives "free from abuse, neglect and exploitation". The Jeremy Vine Show is broadcast every weekday between 1200BST and 1400BST on BBC Radio 2. Click here BBC Radio 2 to hear it live or on demand via the Radio 2 website.